A good deal of fun, between the action, cool set pieces, and witty humor, this one does get a little slow in its second half, and doesn’t hold up nearly as well as the first film. A movie that still has all the humor and vibrant colors and cool sets as the first film, this one just doesn’t deliver on story or action in quite the same ways. That first movie was off the charts awesome. It brought a new kind of energy to the cinematic world, that we hadn’t really seen before. It was like a colorful and humor-filled Star Wars. This sequel is a little darker and more dreary. It’s story is more one-noted. Everything seems to be about Peter’s father, Ego. He saves the Guardians from an enemy that becomes a sort of background enemy for the rest of the film. Then Ego spends the rest of the movie explaining things to his son. The relationships that develop between Gamora and her sister and Drax and Mantis are all pretty entertaining, but it’s the Quill-Ego relationship that is too long and drawn out. When we’re on that plot line, things feel tired. When we’re away from it, the movie always finds itself able to readjust and get back on track to being the kind of fun film this one is meant to be. Guardians of the Galaxy Volume 2 was an okay movie. It was good, but boy did it fall short of the original. I guess that’s to be expected, considering that the original film was absolutely fantastic. It’s not easy to duplicate that sort of thing. You look at some of the great sequels of all time, (Terminator 2, Aliens,) and the situation is that the first movie was just okay. Good, but not great. To get two excellent films in a row is really asking a lot. Then again, the Captain America films did with the second and third movie. The Winter Soldier and then Civil War were both fantastic. And that’s Marvel, the same studio that made the Guardians films, (and the same cinematic universe.) So anything is possible, and with everything he did in the first movie, writer / director James Gunn proved himself to be a natural talent, with both humor and action. And yet still, he definitely missed something in this sequel. The movie starts out great. We see a young Kurt Russell driving around with his arm around a beautiful girl in a convertible, speeding down an empty street in the farmland of the midwest, listening to light, fun, and easygoing eighties music. Russell has been de-aged here, the same way that Michael Douglas was in the opening scene of Ant Man, and Robert Downey Jr was for that one scene with his parents in Captain America: Civil War. This is especially cool for Russell, because it brings us back to a time where he was an icon of eighties movies like Escape From New York and Big Trouble in Little China. The long hair looks fantastic. And it’s perfect for this role, to remind us of those movie, sine Russell is playing Ego, the father of Peter Quill, (Chris Pratt.) Quill was a slacker rebel in the first movie, and a Kurt Russell from the eighties is the perfect guy to be playing his father. In fact, that ends up being one of the leading causes. of this movies downfall. Not that Russell was cast, or anything like that, but just how much time the movie devotes to the father-son story. 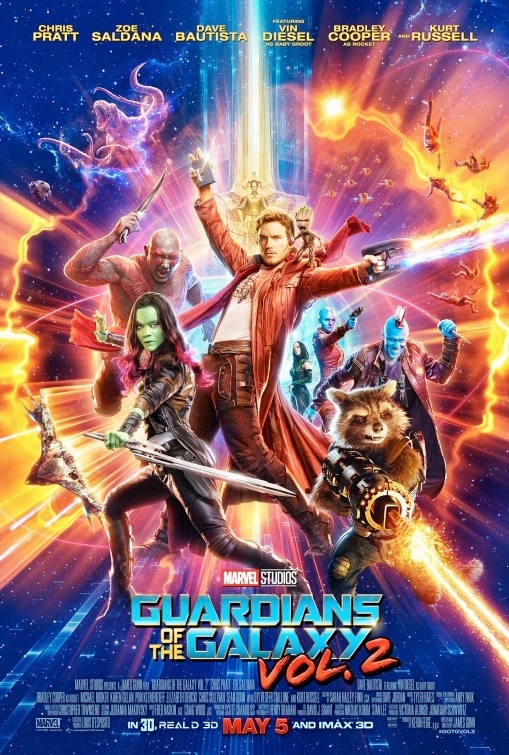 In the first half, it’s all great, but by the time of the second half of the film rolls around, and the entire plot revolves around Quill dealing with his father, we get a little too much of the same. The father-son elements are nice for a background story. Maybe there could be a cool reveal in there somewhere, (for example, the story of how Peter Quill’s mother died, and Ego’s involvement in that, is great.) But what doesn’t work is when the action and antagonist plot line gets tied together with that of the father-son storyline. That’s when the movie is trying to tie everything together a little too neatly, afraid to let the film get kind of messy and fun, the way the first film did. To put it simply, there was a whole group of villains in the first movie. From Ronan (Lee Pace,) to Nebula (Karen Gillen,) to Koran (Djimon Honshu.) Plus, Ronan has a whole army of soldiers who the heroes had to routinely take on. In the sequel, there’s none of that, or anything like it. There’s just one villain. That’s it. Now, I can understand not wanting to repeat the first movie, and trying to make this one very different and that sort of thing, but you gotta find what worked about the first movie and do it again. Otherwise, the new movie has no chance of competing with the first film. Consider it like a band, going out to perform a concert, and not playing their greatest hits. You know that’s what people loved about them in the past. You know that’s what people want to see. So why not give it to them? Luckily the movie isn’t only about Peter Quill and his father, (even if the second half seems like it is.) In the first half, there is indeed another enemy team. It’s a gang known as the Ravagers. And before we even get to them, there’s a great opening action scene and then a deal made with a kingdom of gold people called The Sovereign. The opening action scene, where the gang takes on a giant mouth monster with razor sharp teeth and lots of tentacles, is terrific. It’s great on all different levels. First, the creature is incredible cool. Secondly, the action is pretty good. Thirdly, there’s the comedy of things the characters say while fighting, (Drax, for example, believes the inside of the monster’s skin will be softer than the outside, and so he jumps down the monster’s throat. But the reason why the sequence works, most of all, is Baby Groot. He steals the show. Baby Groot sets up his speakers, plays some music, and starts up a dance routine while the others are all fighting with the creature in the background. There’s great humor to be found in the way that the monster fight is off to the side, and often barely visible. Sometimes we see one of our heroes get thrown into the background, never seeing the action that resulted in him getting thrown there. And the way Baby Groot keeps on dancing, never noticing or wondering about his friends, is a lot of fun. Now we come to the kingdom of the Sovereign. For some reason, Rocket Raccoon steals a bunch of batteries that are valuable to these people. In fact, the batteries are the very thing that the Sovereign leader, Ayesha, hired the Guardians to recover from the monster. Now, the people are paying the Guardians and thanking them for their service and that’s when Rocket steals them. There’s no reason for it. But Rocket does it to kind of be funny, the way he likes to steal body parts from handicapped people, (a joke I never really liked or got, even in the first film.) And so with this action of Rocket’s the Sovereign now target the Guardians and go after them in space. The pods these characters “ride” are drones that resemble a video game, where the people driving the ships are not actually on the ships, but off somewhere playing behind a screen, are pretty cool. When the Guardians stayed the monster and returned the batteries to the Sovereign at the start of the film, their reward was that the Sovereign handed over Nebula, (the sister of Gamora,) who was their prisoner. Nebula was an enemy of the Guardians in the first film. The chase where the Sovereign come in ships and attack the Guardians ends with a mysterious figure showing up to destroy those ships. Now the Guardians split up. 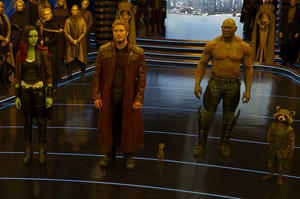 Peter Quill, Drax, and Gamora go to a new planet to meet the figure, (who turned out to be Ego, Quill’s father,) and Rocket and Baby Groot stay behind to watch Nebula. Both groups find trouble. Rocket in particular is hunted down by the Ravagers, who have been hired by Ayesha. He has a great sequence where he puts traps all over the woods to catch as many Ravagers as he can. But it’s not enough. The Ravagers also turn on the blue finned Yondu, (Michael Rooker,) and imprison him alongside Rocket. The two of them hatch a plan to escape and recruit Baby Groot to help them. All of this is pretty cool. What doesn’t work, however, is everything going on with the others and Ego. For one thing, Kurt Russell’s character is named Ego the Living Planet, and it has been known that Russell was playing this character for some time. Everyone wondered how Marvel was going to pull this off. Would we really see a planet with Kurt Russell’s face? Turns out, Marvel kind of cheated. Russell is simply a human here, (as far as appearances go.) Yes, he has a whole speech and story about who he is, how he created a planer, and how he impregnated women on earth, but when it comes to the details, of how the eggs needed to be activated and things like that, this one just gets kind of boring. By the end of the movie, it’s the Guardians fighting Ego, which means trying to plant a bomb on his brain. This does not make for very good action. What made the first movie so great was going to all different locations, and facing off against lots of different enemies. Here, we do get the Ravagers and the Sovereign in their ships, but the second half is dominated by Ego. And how do you have an action scene against a planet, let alone a whole series of action scenes against him? Luckily there’s enough good in this movie to not let that bog us down. There’s Sylvester Stallone appearing in a great cameo. There’s a character named Mantis who can tells people’s inner feelings, and develops a relationship with Drax. And there’s the talk between Gamora and Nebula about why they are enemies and why Nebula hates her sister. All of these things work. Guardians of the Galaxy Volume 2 is pretty good for most of the way through. It’s only in those climactic scenes, and when the movie devotes too much time to the Ego plot line, that it seems to lose its way. Other than that, there’s a lot to like. All of the characters from the first film that were so great in that movie are back in full form, and it’s nice to see them again. The humor is there. The colors and sets are vibrant. And lots of the action is cool. 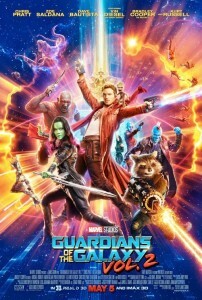 I like the way the movie becomes about relationships, (Gamora and Nebula, Drax and Mantis, and Peter having to figure out who his true father was, Yondu or Ego. If only Ego had been cooler and given a better storyline that distract from everything else, this could have been a much better film.